I've only played a few games spread out across a bit of time; my original playthrough was at the Charity play at Gencon (where my wife and I won a copy. I sold it to another person at the projected retail cost because I was expecting my KS edition through a blind auction at the LGS. Actually happened to meet the guy who won the auction, and he loves it, so I felt extra good about him being able to play it early with the copy I'd won by random chance, while also helping a charity I support personally). Since receiving my KS copy, I've played two additional games. The charity game was with four players, the first game on my KS version with six, and the last game I played was with three. I guess I'm just interested in what people think about the game with different numbers of players. Obviously, I felt four players played well. You're likely to be able to form an alliance, even if it's not an ideal one, and thus betrayal has more consequences so it's not used as frequently. I happened to win this game; my first game of it ever, so that might have colored my perception. I was the Dragonfly clan, and I came from behind (3rd place) to win in the last war against a smart Bonai (yellow) player who'd kept his honor low and relied on lots of Oni. Smart when everything costs you one coin at most. He'd led the entire game, and I was only a few points ahead at the end, basically via stealing points with hostage taking. Base game, so no special monsters, Kami figures, etc. I thought the component quality was good, and well worth the expected retail cost. My second playthrough, the first with my KS copy (everything but the playmat, which still hasn't arrived at the time of posting this) didn't go so well. It's a very attractive game, so we picked up one player who just liked how it looked, but half-way through the first season determined it was too complicated for them. Bless him for staying anyway through 1.5 more seasons, but then he left. Another player sat down to play with us only so he could flirt with a pretty 19 year old woman who was also playing, and when she wasn't interested, his interest waned completely too. He kept playing until the other guy left, and he didn't harass the woman or anyone else, just played on his phone and didn't do much when it was his turn. Even numbers, so everyone was in an alliance, but with two players either disinterested or overwhelmed, it soured the game for two more players, leaving the woman and I to dominate the game until we called it quits after the second season when the two quit playing. She was simply too far ahead and the other two players wanted to quit too. Then came the real horror; putting the game away. The KS copy has extremely great components. Unlike some, all of my tiles were correct, there were no problems. No broken peices, and other than the playmat, nothing didn't ship. It all did fit in either the base box, the Daimyo box, or the Dynasty box (which I didn't get out). But putting it back was a huge pain. 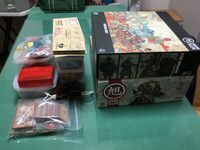 There were no zip-bags included; there seemed to be no designated place to store the Kami cards, the War Province Tokens, or the colored bases. Figuring out which figure went where required us to look up someone's helpful screenshots here on BGG, on a cellphone, and squint. It took us close to 45 minutes to put away. My last play through was only with three people. With six players, the first three players will get to choose four mandates, while the last three only get to choose three, which is a significant disadvantage, particularly if two of the players in the first three ally together, denying actions to the second half of the player group. We never got that far in our six player game, so I don't know if it'd make a huge difference, but it seems likely. With three players, my first odd-numbered player game, you obviously have one player who sits through the whole season without an alliance. In our game, this resulted in one player being stuck in his home province (no one played a marshal and he didn't win the Kami that lets you move) the entire first season, and there was no war in that province, so he despite having the largest force on the board (until Fox clan's power kicked in at the beginning of the war, letting them take over every unoccupied territory), he got nothing. Betrayal did get played, but not by him, interestingly enough. He was also the turtle clan, so not having marshal was a double-wammy. The game ended with him vastly behind, and the fox player vastly ahead, because not only did he get to choose the first mandate of the summer season (harvest) but he controlled half the board because of his power. Masterful move that we never really recovered from. He mopped up that season because he gained a ton of points and coins. And of course, I was allied with turtle that round, who betrayed me again. The game ended with fox will in the lead, me (Koi) in the middle having kept up with Fox after his super-harvest, and Turtle so far in the rear that it took him seconds to count his winter score. A lot more mandate choices per player, and everyone got the same number of choices, but frankly the game didn't feel well balanced that way. Fox becomes vastly overpowered in a lower playercount game, it seems. Though in all honesty it mostly came down to the luck of the mandate draw. Experience let me put things away much faster; it took about 20 minutes instead. A large part of that could be attributed to not getting out the models until someone bought them, rather than pulling them out so people could see how nice they are. I enjoyed the game each time, though the two players in the second game were frustrating (particularly the guy who just wanted to flirt. Dude, come to play games, not play the pick-up game) and the third game was frustrating because it feels like the lower player count exasperates imbalances. I feel like 4 to 5 players is the sweet spot. I've yet to play with the Dynasty clans. There's just so much... stuff to this game. I don't think you have to be an experienced Rising Sun player to enjoy the game, but you need to be experiences and playing strategy games with a large number of possible actions, but a very limited number of them. My first and third games flowed so much smoother than my second simply because everyone playing was of a strategic mind. This is not a casual game. I also don't think the time on the box is remotely accurate. Maybe 120 minutes with three players who are experienced at the game already, and not counting getting the game setup or tearing it down and putting it away. My three player game took just under 3.5 hours, including putting it away and setup. The four player game was setup for us, and we didn't clean it up, but took almost the entire two hours. The six player game made it to the end of Season 2 in 2.5 hours, so with setup and explanation, and then the long cleanup, it was really close to four hours and we only finished about two thirds of the game. I'm very interested to hear people's impressions of games with differing player counts. Obviously, Any playercount other than three means an imbalance in the number of political mandate choices, always favoring the players who start with higher honor. I'm guessing this has been accounted for in the balancing of the game, but I think that balance depends on players playing a certain way and making certain choices to rectify that balance, and certainly to new players those choices are not obvious. This is a 4-5 player game. The game does not work well with 6. With 3 players maybe players should not be allowed to ally twice in a row. I have yet to play my first match with others, but I don’t anticipate any player count issues, as I’ll probably select which clans will be played depending on player count. I usually play games at my home, so the players coming determine what kind of game we’ll be playing, so I never really have any mismatch there with players and games not being compatible. Also, I have everything set up the night before and can put things away at my leisure, so no problems with that either (also I’ve taken pictures of all the trays and component placement, so I’ve got that to go by, too). However, recently, a local bar has been having a Games Night, so I’ve sort of taken on the role of games provider. In consideration of being able to play there with the right pre-selected group, I’ve created a travel version to make set up and take down lightning quick (again having taken photos). Here is a side by side travel version vs shelf version (mat travels in its tube). I'm very interested in people's opinions on this issue. I am waiting myself for some more variation to share my impressions; my 3 games so far have all been with 4 Players--not by intention. If people are going to post here, if would be useful if they'd mention how many plays they've done and at what player counts, as the OP did. Have played 2 games with 5 players, and one with 4. I don't foresee any problems with 6 players other than some extended time, and the fact that every province is a battle can shift things a bit. Doesn't seem to be anything earth shattering. I think 3 players will sink or swim based on the players themselves. If 2 players ally every turn, the same two players, the game is going to be really rough for the odd man out depending on which clan they are. First play with 4 people took about 3 hours including teaching the rules. It probably was 2.5 hours of game time, but we were obviously inexperienced. I think everyone enjoyed it despite some mis-plays. Was a lot of fun to me. Only played with base game items except for token bling. I didn't find putting minis back in the container terribly difficult (dragonfly was worst for me) despite not using a reference. Also will just store tokens under clan minis in one of the smaller boxes within the core box. If the odd man out is way behind in the points, the allied players will want to ally with him during last season rather with their direct contender. Obviously, one of the 2 allied players will have an advantage. The solo player has to negotiate with the player behind to form an alliance with him. If you can't negotiate it, it means the player behind is willing to king make the primary player, and you might as well concede the game at that point. You may need some coins to sweet the deal. There is no 3 player game that doesn't suffer from one player misjudging the power situation and then ganging up with the wrong player. This game is not really worse than others in that sense, but it is more unforgiven than most games when new players are still working out the rules and mechanics. The rule of not making the same alliance twice is tempting But since I have tried being the one being kept out of alliance for 3 seasons in a row, while it was by the way the right things for my opponents to do,( as i was the leader) i would be hesitant to house rule against it. I would rather just suggest it as a good rule of thump. I’ve played three 4-player games and one 6-player game. The number of players definitely have an impact on how you play the game, and certain clans are definitely more effective depending on player count. I don’t think this is a bad thing though. It can make for an entirely different game experience. In a 6 player game you have to keep a close eye on Fox. Where in a 3 player game Lotus gets to play far more mandates, making their ability that much stronger. I noticed Betray almost never gets played in a 4 player game. I think the risk of making yourself the odd man out by being the first to Betray is too big a detriment. The only exception I could see is playing a no honor game. Where you plan on not having an ally or being betrayed, and just hate draft mandates you know everyone else wants. So far I have played a four and three player game and saw no issues with player counts in each. In fact in our 3 player game last night I won despite the other 2 players allying in Spring and Summer. I had Bonsai (yellow) vs Turtle (green) and Dragonfly (blue) so I started with the lowest honor as well so I was outbid on all temples in Spring very quickly. I focused on Betray, and Harvest to offset their alliance and successfully benefited off their Recruit and Train Mandates enough to keep me in the running. Plus since they were aligned they were reluctant to be in the same province (I messed with their heads stating "an alliance can be broken with betray so be careful of your ally" and thus they were ). Use their perceived strength to your advantage and take on battles to get a variety of provinces. That pushed me to the win, it wasn't easy but it can be done. I'm baffled why you don't do eight mandates a season. Equal choices for 4 and 6 players. Also, seems everyone is low on money and troops at the end of the first season, which makes combat not very interesting. This would help that issue too. I didn't mind the game, but I didn't care for the first game I played. We played 5 player and I was yellow. I also couldn't get an alliance for the first two rounds (anyone who played should see where this is going). The top two honor players teamed up and were the first two to play, then the next two went. Basically for the first 2 round I only got the secondary ability 2 times, and this was my first play through so I had no stategy. My friend who owns the game defends that I had a lot of options and could have done better. I played a 3 player game later, and liked that way better. Also I feel 4 and 6 players would be better because everyone would team up. Since Lotus has highest honour and gets to play 5 mandates while everyone else plays 4 and can dictate the flow he should've won, right? He came dead last. He won several WPT on the other hand Bonsai player came second and he only won one WPT, Fox also came second with several WPT Dragonfly came 3rd and Moon came first with 70 points and 5 WPT and my honour never rose more than 2 places. I was hindered several times by other players recruiting, but you adapt and make do with what you have access to. The only thing higher numbers of players affect is play time.